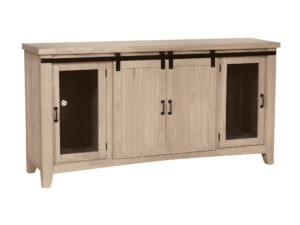 The barn door style TV stand trend is in full flow at the beginning of 2019. 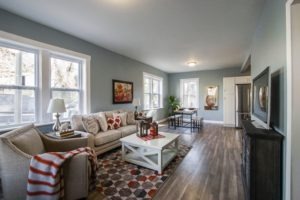 Each year, we always see certain things that stand out, and this seems to be one of the hottest interior design trends right now. Everywhere you look, people are buying barn door TV stands to add something extra to their living room. As with all trends, this throws up plenty of questions; what are barn door TV stands? Why are they popular? How do they make your living room stand out?! Don’t worry, we’ve covered everything you need to know about this trending topic in this blog post! What is a barn door TV stand? If you’ve never seen one, then you might be confused by what a barn door style TV stand actually is. But, it probably comes as no surprise to know that barn doors are the main inspiration for this piece. Mainly, the design is focused on replicating the barn door look, but condensed down into a TV stand format. The results are truly stunning! You will see a range of beautiful rustic TV stands with doors that look like they’ve been taken off an authentic barn and shrunk down to size. They’re wood-based designs, but the look extends beyond your typical wooden TV stand. There are little details here and there that bring a real farmyard element to your interior – it’s a piece of furniture that really jumps out at you. Why are barn door TV stands popular? It’s pretty easy to see why barn door TV stands are trending right now. You see, they have that beautiful blend of great visuals and extreme practicality. As we’ve already touched upon, they look absolutely stunning. Not only that, but there are a surprising diversity of designs out there as well. From super rustic looking stands to slightly more contemporary ones. As a result, this product becomes suitable for a variety of different living room styles. What’s more, they’re just so useful to have in the living room. Aside from the obvious purpose of providing a stand for your TV, they pack so many other features as well. For one, you can get a barn door TV stand with classic sliding doors. These replicate real barn doors that slide to open, rather than swinging outwards. Therefore, this can save space in your living room by using the sliding mechanism. So, they’re popular in small rooms as well as large ones! The benefit of this is that they can afford to be a little bit deeper and spacious too. So, they double up as storage for your living room as well! When you take these things into account, it’s already clear why this is on-trend in 2019. Plus, you have to factor in that rustic furnishings are very popular and stylish. People want to add a traditional look to their homes – particularly in the living room where the aim is to create a comforting, homely atmosphere. In short, a barn door style TV stand ticks all the right boxes for an interior design trend. It’s gorgeous, practical, and will actually add something to the room. How can a barn door TV stand make your living room stand out? With a lot of TV stands, you don’t get something that becomes a focal part of the room. It’s more of an accessory – something you need for the practical reasons. But, with a barn door TV stand, you can flip things and make it a significant aspect of the room. They can make your living room stand out as they’re quite bold and in-your-face – but in a good way. It’s the type of thing people notice as soon as they walk into your living room. It’s a conversation starter, people go ‘ooh that TV stand is nice, where did you get it from?’. The authenticity and rustic nature will naturally make it stand out inside a home. Especially if you choose a design that really looks like an old-school barn door! Like we said earlier, it brings that almost farmhouse feel to your living area. It instantly makes you feel like reclining on your sofa with a fire blazing away as you watch a nice film with the family. We see this product as a statement piece; something that will take center stage in your living room and draw eyes towards it. At the end of the day, it’s always good to keep up with current interior design trends. 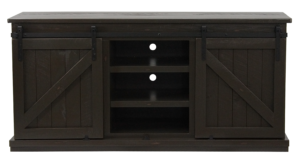 A barn door style TV stand is one of the most sought-after pieces right now. So, if you want to add something to your living room that will really make a difference, then perhaps one of these will be perfect for you.